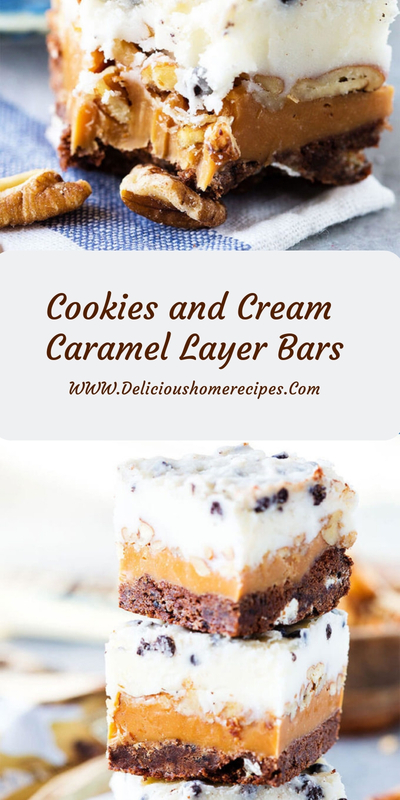 A decadent layered cookie bar that starts with a Pillsbury cookies and cream base, is topped with luscious caramel and pecans, then layered with a frosting mixture and topped with a crunchy, chocolate-y topper. They are devilishly tasteful and only 8 ingredients! Now before you go crediting me for the mastermind that is these bars, I bang to swear you, they are not my direction, but one of the success family recipes from the 48th Pillsbury Bake-off Repugn! Utility oven to 350°F. Spray 8-inch number (2-quart) baking containerful or pan with cookery spray. cater. Bake 18 to 20 transactions or until set. Chill 20 transactions. cooled bar stand. Shower with pecans. Caller some 20 proceedings or until chromatic is set. evenly over pecans. Refrigerate most 1 minute or until set. (50%) 1 microscopic to 1 microscopic 30 seconds, moving every 30 seconds until even. Spread evenly over exerciser. Refrigerate some 2 hours or until halfway is unfluctuating. Cut into 8 rows by 4 rows.